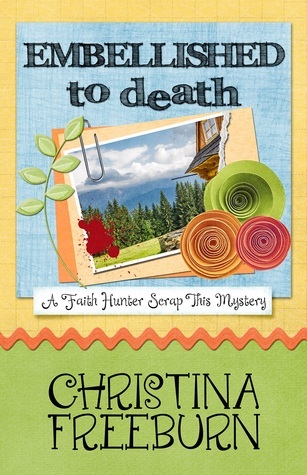 Embellished to Death is my first introduction to the Faith Hunter Scrap This mystery series. I’m afraid that fact put me at a disadvantage. Embellished is the third book of the series and, in reading, I found myself with more and more questions about characters, their connections to one another, and the circumstances that brought everyone to where they are now. However, that said, Embellished to Death is an intriguing read. Set at a scrapbooker’s retreat in West Virginia, the action begins almost immediately with a parking lot hit and run. Finding herself a witness by virtue of a near miss, our heroine and narrator, Faith Hunter, immediately inserts herself in the investigation. (As any and all self-respecting cozy sleuths do!) An already confusing situation becomes even more muddled for everyone – readers included – by the addition of an identity thief and a rogue private investigator. I admit having a little trouble keeping the various plot threads and suspect characters straight. The blessing in this book is an abundance of richly drawn characters who are relateable and very human. What Embellished to Death may lack in polish and keenly-appointed detail, it more than makes up in heart and depth of character connections. Perhaps the best indicator of success for a story is if a seed of curiosity to continue reading the series is planted. In this case, I can readily answer yes. I’m curious to go back to the start of the series, not to mention eager to see what is in store for Christina Freeburn’s characters moving forward.